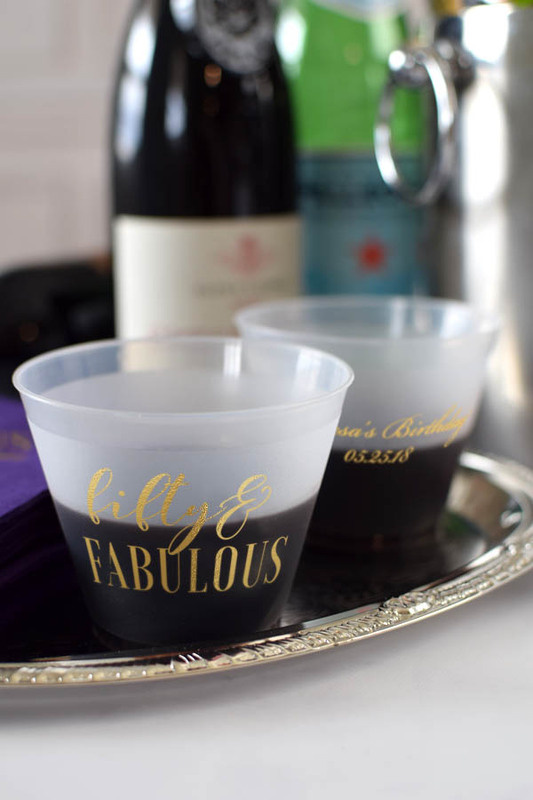 Serve wine, champagne, and punch in these reusable, custom printed plastic birthday cups. A great addition to any milestone birthday party, your guests can take their cups home as souvenirs afterwards. Personalize your cups with a festive adult birthday design and your own custom message printed in your choice of imprint color and lettering style. These 9 ounce cups are the ideal size for holding wine, champagne, and punch. Made from frosted, flex-plastic and dishwasher safe in the top-rack. Excellent service, quality and delivery time. I was very happy with the continual service I received before my order arrived to ensure it was what we wanted. It came in record time and was just like the picture. These are for my dad's 80th birthday next year and I am sure he will be ecstatic with them. This is my second time using Tippy Toad and I highly recommend them. It's easy to order, they are helpful with questions and the product is high quality and comes quickly. These cups were perfect for my 40th Birthday. Everyone loved them. My cups look great! They were easy to read and make out the picture even though the glass was frosted. I'm very happy with my purchase!